Place one sliced onion at the bottom of Crock Pot. Stud pork roast with cloves and season with salt and pepper. Return the pulled pork to the crockpot. Mix in the chopped onion and BBQ sauce and cover. Heat on high for 1-3 hours or until the onions are soft. 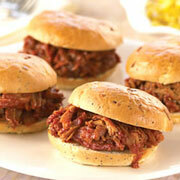 Serve on large, crusty buns with a mustard based Carolina-style BBQ sauce. Garnish with dill pickle spears, thinly sliced raw onion and pickled pepperoncini (Italian banana peppers). Serve with crisp, homemade slaw.